Heeft u een vraag voor Merciel Retreat & Resort Ngapali? 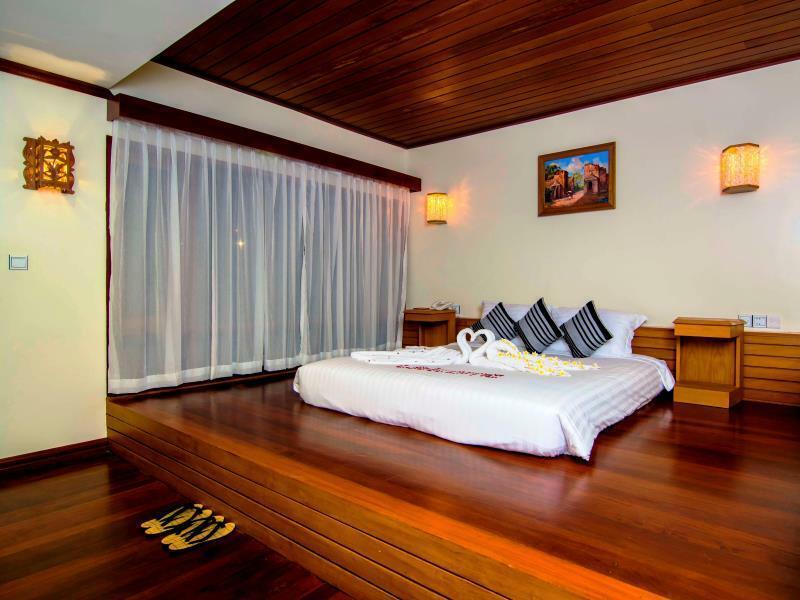 Een kwaliteitsaccommodatie voor wie geïnteresseerd is in stranden, restaurants, romantiek: het Merciel Retreat and Resort in Ngapali is een prima adres voor zowel zakelijke reizigers als toeristen. Op slechts 0.5 km gelegen vanaf het stadscentrum en 0.1 km van het vliegveld, trekt dit 3-sterren hotel jaarlijks vele reizigers. Dankzij de praktische locatie liggen alle belangrijke trekpleisters in de buurt van het hotel. Het Merciel Retreat and Resort biedt een onberispelijke service en alle essentiële voorzieningen om reizigers een plezierig verblijf te bieden. Maak in het hotel gebruik van een selectie topklasse faciliteiten, zoals gratis wi-fi in alle kamers, dagelijkse schoonmaak, taxi service, 24-uur receptie, wi-fi in openbare ruimtes. Het hotel heeft 42 prachtig ingerichte kamers voor gasten, elk met plasma tv, handdoeken, airconditioning, wekservice, bureau. U kunt de hele dag genieten van de ontspannen sfeer van de zwembad (buiten), wellnessfaciliteiten. Het Merciel Retreat and Resort is een ideale verblijfsplaats voor reizigers die charme, comfort en gemak zoeken in Ngapali. Voor transacties met een creditcard geldt een toeslag van 3%. De tarieven voor het galadiner zijn gebaseerd op kamertype en bezetting. Neem voor meer informatie rechtstreeks contact op met de accommodatie. Merciel is een zeer fijn hotel. Comfortabel, mooie ruime kamers, vriendelijk personeel. Een prima restaurant. Rustige omgeving, en het heeft een mooi zwembad. Een prachtig uitzicht op zee, met een fantastische eb en vloed. Helaas ligt het aan het 'rotsige' gedeelte van Ngapali beach, zodat je niet aan het strand kunt liggen en ook eigenlijk niet in zee kunt zwemmen. Voor strand en zwemmen in zee moet je met een taxi naar verderop gelegen hotels, een kwartier rijden. Verder geen enkel nadeel te noemen. There are rocks everywhere on the beach. Rooms are good and big. They dont have their own bikes for renting. Breakfast isnt great. They didn’t add anything except pancakes and eggs so if u come by the end u wont get anything. For the price u can find better options. My stay at this hotel was nothing short of amazing. 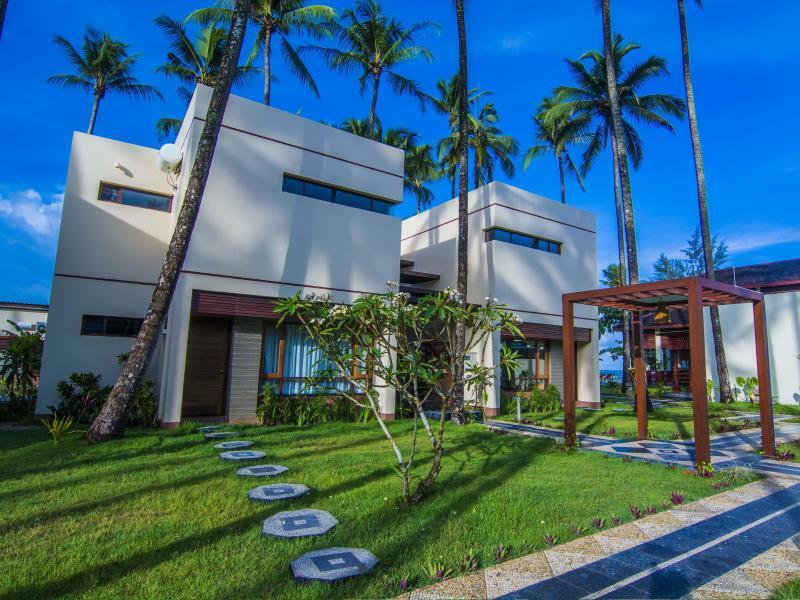 The pool is wonderful, the rooms are massive, the breakfast is great, and you can access a great (sandy) beach right in front of the hotel (while a short 5 min stroll down the beach takes you to a rocky picturesque beach with small pagoda). The best part of this resort is definitely the staff who go above and beyond to make sure that you are well taken care of. I forgot my book on a pool chair, realizing only after I had checked out. The reception dropped it off at the Hilton next door where my good friend was staying in order to get it back to me. One night I was even invited for a free cocktail tasting at the bar as the bartender was sampling a cocktail (AMAZING) for an event the following evening. Next time I can only hope to come back for longer. After getting off the plane to and from the airport was very quick. The staff were very nice and even though the English was a bit rare shall we say, but the again my Burmese is nearly nil, we always got there in the end. Room was nice and clean and having the beach very close make it all the better.Maybe I’m get old but after staying at Other hotels, I’ve just booked it again for my last couple of nights before I fly. I would book this again when I return here even just to get your feet before you venture out further south. But knowing what I do now this is the place you want to stay just before you fly back to wherever you came from. Knowing its grey and cold and I hear the Xmas is already started back home. Me laying on the beach with a cold beer and no hassle helps me get over my fate whenI head home from this warm and friendly place. I wish I had done this before when I threatened to do it over 5 years ago. As a monk said to me,live in the moment now. The location of the hotel left a lot to be desired; it was just beside the airport (convenient though!) and had a very rocky beach, so not very swimmable. Thankfully there was a pool. We also appreciated lounge chairs near the room so we could enjoy the quiet. The room was clean, but the bed was loud whenever we moved on it. Overall, good facilities and service. Also, good prices for food and beverages. Right on the beach and 5 mins from airport...swimming in aqua water whenever we felt like it. Bikes available to discover the local way of life. Beds turned down before bedtime!! Would go back in a blink. 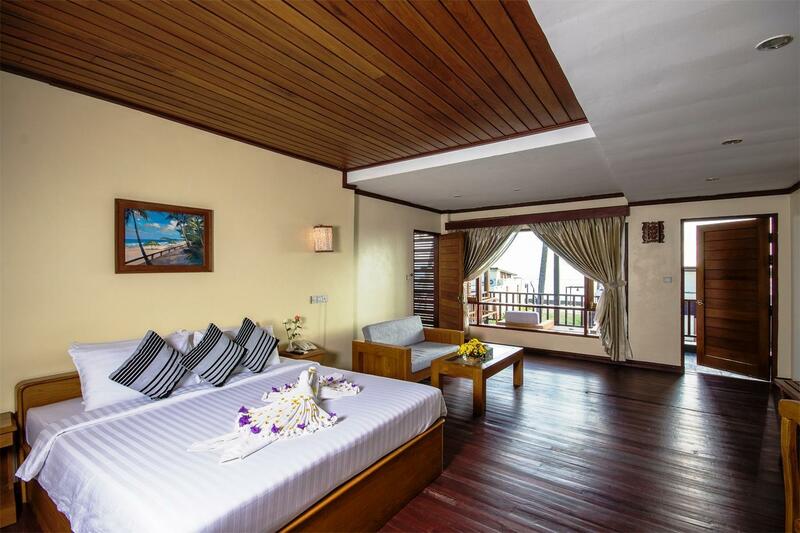 This hotel is very nice and very clean with beautiful view to the garden an the sea. All staff and managers are very very helpful and nice and speaks good English. 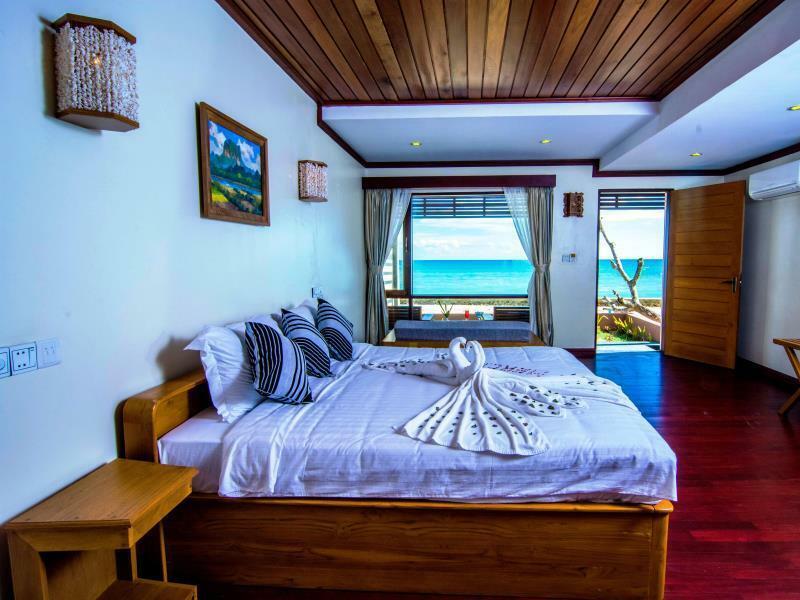 Hotel is located on a good place, not far from airport, but it´s ok and not noisy from airplanes, and you can also take a bicycle and ride a bike around Ngapali beaches and fisherman´s village. Or if you donť want or can´t ride a bike you can take the taxi tuk tuk around 10000kyats to go to next beach and back (but in the evening I recomend you to take a good clothes like longsleeve shirt or jacket and trousers - very strong cold wind inside the tuk tuk). There are the rocks in front of hotel, but if you go a little bit to the right side of the beach, there you can go to the sea with no problems. All food is delicious and taste very good. Maybe on the breakfast there it could be wide choice, it´s everyday almost same. Hotel is located just south of airport and whilst it is a 30 minute cycle on complimentary bikes to the main beach there is a small sandy beach beside hotel. The staff & French manager in particular are very helpful & friendly and will do all they can to make your stay as pleasant as possible. The rooms are huge, the hotels gardens are superbly maintained making it a perfect location to sit on your balcony at the end of the day. Breakfast buffet food was excellent. Coffee supplier needs to be sacked as it is awful. There are local restaurants a 5/10 minute cycle away or the ever present tuk tuk's outside hotel will take you there and back. When you consider the cost of the tuk tuk's against considerable extra cost to stay at most other hotels the hotel will still work out much cheaper. You are also very close (30 minute cycle) to the most beautiful empty beach you will encounter in SE Asia !! We went with my parents and my two young children and found this place to be absolutely ideal. It is very close the airport so there is no time in taxis. The beach is perfect for young children when the tide is out because it is huge, flat and full of shells and rock pools. The staff are a delight and the restaurant is good enough (and affordable enough) to ensure we were very happy to stay and eat there every day. I couldn't have asked for better. Staff are truly incredible and consistently went over and above! In the hotel's ads it say it has beach front. It is beautiful but instead it is not fit for swimming or walking along the shore. It has very short and narrow beach front. Disappointing. I would not recommend this hotel if you want to walk along the white sand shores and sun bathe unless you just want to swim at their pool. Beautiful resort with white sand private beach, turquoise sea and blue sky, foods was better than i expected by using fresh seafoods rather than frozen. I will definitely come back with my love one again! Second time here. Love it. Enjoy every moment of my stay. Very nice hotel next to Thandwe hotel. We spent three days there and had a great time! The staff and managers are very friendly and helpful, always trying to satisfy your needs. The only weak point is that it is far from other restaurants on the beach. I highly recommend this hotel for families, couples and individuals. My friend and I spent 10 days in Myanmar and wanted to end the trip on a relaxing note and ended up doing 2 nights/3 days at the Merciel Resort. Its a beautiful spot right on the water and so close to the airport and the shuttle service was included with our stay. The food was delicious and the staff went out of their way to help us (especially when the bugs were biting one night at dinner, a woman from the front desk brought us her personal bug spray). We took full advantage of their complimentary bikes and ended up doing a great morning ride down through the region. Everything about the place is beautiful, can't recommend it enough! A large group of 20-year-olds taking a break from Semester at Sea showed up the 2nd day of our stay and had a somewhat disruptive effect on what was otherwise a delightfully tranquil resort. They were cramming 6-8 people into each room and partied loudly. I wish the Merciel staff had taken a firmer stand with that group; they had already been kicked out of the Hilton next door. Other than that, it was a wonderful place and I think the odds of another "Spring Breakers" group showing up is very slim. Rooms are quite nice and large. Nice seating area outside. Beautiful location, nice swimming pool. The bar drinks and food are a bit expensive for those on a budget, and the location is pretty far away from the main stretch of beach with other hotels and restaurants. If you're a couple and just looking for a nice quiet place, it would deliver. My friend and I ended up moving to the other beach eventually, because it is less rocky and in some cases more affordable. We absolute loved this hotel, very close to the airport however we were not annoyed by the noise of the airplanes as there were only few flights to Thandwe Airport per day. The hotel is very large with a private beach and lovely swimming pool (especially sunset time). There is a spa facility which is a plus. Breakfast is to die for. There are so many choices whether Asian or European meals offered. The hotel offered free wifi and bicycle but the wifi is not quite stable as it should be however who would want to spend online if you could enjoy so much everything else. Local street market is not far and there are plenty of restaurants along the street. We went to Sea Queen Seafood restaurant and absolutely enjoyed their lobster there. You may need to book it first as it was easily fully booked by walk-in customers nearby.